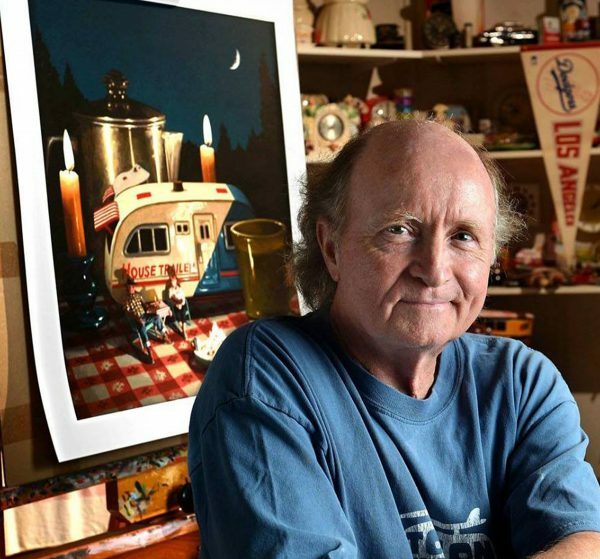 Artist Scott Moore is the recipient of the 2019 Laguna Beach Arts Alliance (LBAA) Lifetime Achievement Award, which will be presented during the 13th Annual Art Star Awards on April 7. Moore has lived Laguna Beach for 39 years and is currently the vice president of the Festival of Arts. As a past president of the FOA, and while on the board in 2002, Moore helped create a 40-year lease with the city of Laguna Beach. He is currently the president of the FOA Foundation, a nonprofit organization created in 1989 by the Festival of Arts. Moore grew up in Bellflower, California, playing baseball, delivering newspapers and drawing in his spare time. His father was a watercolorist and graphic designer for an advertising agency in Los Angeles. Moore was an illustrator for the United States Marine Corps at the age of 20, graphic designer at age 22, and full-time artist/painter by the time he was 29. He was stationed in Hawaii during his stint as Official Artist for the United States Marine Corp, where he designed publicity posters, created illustrations and graphics for servicemen’s books and made décor for Marine Corp balls held at Hilton Hotels. Moore also did graphic design for the Festival of Arts. He painted traditional watercolors up until 1985, receiving numerous awards on a national level. In the mid ‘80s, while showing at the Festival of Arts, he not only added oil painting to his skills, but also began transitioning into the world of surrealism. “I am very honored to receive this award from the Laguna Beach Arts Alliance. The members of the Alliance make up the cultural glue of this amazing arts community, and it makes me proud to be chosen by such a prestigious organization,” Moore said. To purchase tickets to the 13th Annual Art Star Awards, contact: [email protected] Tickets are $100 each and include dinner as well as the festivities. The Laguna Beach Arts Alliance (LBAA) is now accepting applications for the $5,000 seven-degrees of inspiration grant. The goal of the grant is to provide support for an emerging or established artist to develop and present an innovative arts project or program that advances recognition of Laguna Beach as a vibrant arts community. It also enables the artist to expand and diversify their audience and provides an opportunity for advanced learning and progression. LBAA and seven-degrees announced that this year’s submissions will be open to all artists residing in Southern California.